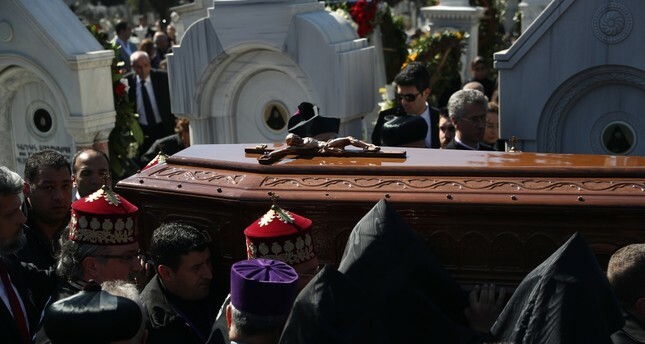 People carry the coffin of Patriarch Mesrob II at his a funeral in Istanbul, March 17, 2019. The death of Mesrob II, the revered head of Patriarchate of Turkey's Armenians, means a new election will be underway soon, putting an end to uncertainty regarding the future of the respected post. Mesrob II passed away on March 8 after a fight against dementia for 11 years. The illness had put the patriarch into a vegetative state, confined to a hospital bed for years. In his absence, the powerful Armenian Patriarchate was led by acting patriarch Aram Ateşyan. Nevertheless, the post of acting patriarch, which did not exist before in the long-standing patriarchate, had stirred up controversy in the community and many called for an election while Mesrob II was still alive. The Turkish state which has authority over elections had not authorized the patriarchate to replace Mesrob II, citing he was still alive, despite calls by Ateşyan and his dissidents for elections. The community is currently observing a lengthy mourning period for the late patriarch that will end in Easter in mid-April. After the end of the mourning period, an election process will start to choose the 85th head of the Armenian Patriarchate. Bishop Sahak Maşalyan, who heads the Religious Council of the Patriarchate, is one of the candidates for upcoming elections. Speaking to Anadolu Agency (AA), Maşalyan explained the process and recounted the unique situation they found themselves in after Mesrob II's illness. "This was a first in the church's history. Neither the Patriarchate nor the state knew what to do next. The most sensitive approach was certainly to keep hopes alive [for the recovery of Mesrob II]. After all, we believe in miracles and prayers. It was only a few years after the patriarch's hospitalization that we started considering an election. It took seven years to fully start an election process and we elected a trustee in 2017 to oversee the election. Yet, the process somewhat stalled as our patriarch was still alive and eventually, the state told us we could not hold a new election under the circumstances," Maşalyan said. Turkey is a secular country but the affairs of religious minorities is a thorny matter. "After the mourning ends, we will either elect a trustee or acting patriarch [who] will oversee the process. It is up to the Religious Council [of Patriarchate]. This will be followed by formation of an election committee comprised of non-clergy members of [Armenian] community," he said. Archbishop Aram Ateşyan was appointed to serve as Patriarchal Vicar or acting patriarch, as Mesrob II had to withdraw from his duties due to his illness but he has faced criticism from prominent figures in the Armenian community for allegedly blocking bids to start an election process. The dispute was partly resolved when an archbishop was appointed as trustee for the launch of the election process, but it failed to quell tensions in the community. A group of Armenians had filed a lawsuit to remove the state regulations blocking the election. The Orthodox Patriarchate has the largest congregation in the community and it traces its roots back to the conquest of Istanbul by the Ottomans and Mehmed II (Mehmed the Conqueror) who is credited with paving the way for the establishment of a patriarchate. Before the sultan granted them religious freedom, Armenians were forced to pray in the Byzantine churches of other communities in the city. The patriarchate was an influential religious authority for Armenian communities around the world until the early 20th century, but its influence has decreased over time, especially after the Armenian population in Turkey diminished following World War I and after the collapse of the Ottoman Empire.